Our rifle hunts occur in several of Alberta's top producing whitetail areas including the prairie areas along the Montana border and the foothills and mountain regions along the eastern slopes of the Canadian Rocky Mountains in SW and west-central Alberta. Trophy Hunters Alberta (THA) provides a Whitetail hunt in the mountains, the foothills, the prairies and everywhere in between - bush, woodlots, open country, river bottoms, coulees, draws, grain fields, etc. Years of experience, combined with access to some of Alberta's finest Wildlife Management Units (WMUs) allows us to customize our hunts to the preferences of our individual hunters to maximize the odds for success. These special 4-day prairie whitetail deer rifle hunt in the southern prairie zones (WMUs 104, 106, 110, 132, & 134) are exclusive to Wednesday through Saturday each week throughout the month of November. The Province of Alberta only allows rifle big game hunting in the prairie WMUs for four days per week during the hunting season. These are private land hunts in relatively open country with the whitetail deer being concentrated in the river bottoms, woodlots, coulees and draws. 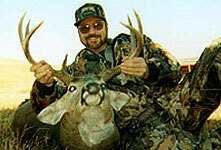 Our guides have excellent access in these areas and currently guide these whitetail deer hunts. The foothills rifle whitetail deer hunts occur in the rolling foothills in the corridor west of Edmonton and Calgary. About a 1-3 hour drive northwest of Calgary (WMUs 318, 320, 322, 324 and 326. These areas are mostly forested harboring many fine whitetail and mule deer. These bucks tend to have the darker horns that we like to refer to as 'Bush Bucks'. These hunts utilize local motels, or chalets style of accommodation. 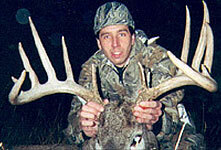 Typically, 4x4's, walking, ground blinds and some tree-stands are utilized depending on the location and style of hunt. The physical condition of our hunting guests plays a key factor if walking is chosen as the hunting style. These mountain rifle whitetail deer hunts occur on crown land in the eastern slopes of the Rocky Mountains about 1-3 hours northwest of Calgary (WMU 429). This area is a semi-rugged zone harboring many fine whitetail and mule deer. These hunts utilizes a remote tent or trailer camp. The remote camps may utilize several tents and/or trailers that provide sleeping and cooking/eating facilities for our hunting guests. Each tent has its own wood stove and good, firm sleeping cots. Hunters in this camp require their own sleeping bags. The long-term average daily high temperature during the last week of November in this area is about 25 degrees Fahrenheit. For those that wish more comfort, we may also stay in local accommodations. We conduct these hunts annually from September 17 through the end of November. Typically, ATVs, snowmobiles, 4x4's, walking, ground blinds and some treestands are utilized depending on the location and style of hunt. The physical condition of our hunting guests plays a key factor if walking is chosen as the hunting style. Camp size is typically 2 to 6 hunters per camp. Mule deer can be added to both the foothills and mountain areas, if desired.